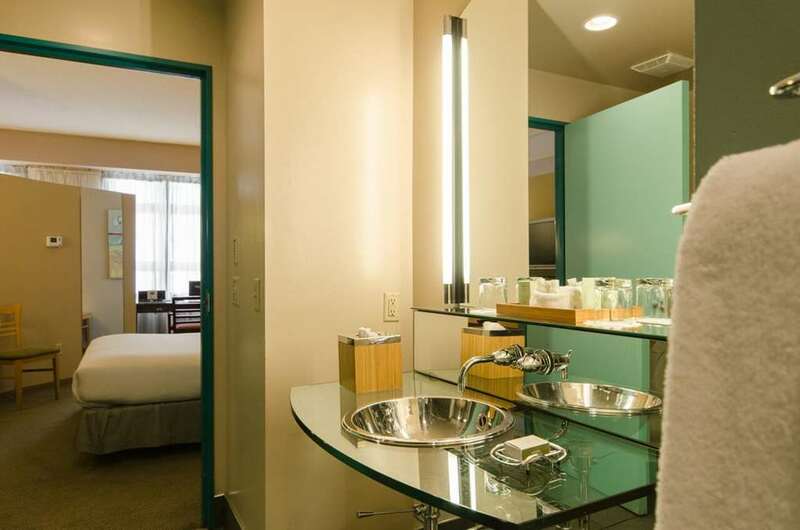 Hotel Metro is an all suite Art Deco boutique hotel located in the heart of downtown Milwaukee. Suites average 550 square feet and some offer separate living rooms flat screen TVs free high speed wireless access standing glass showers and large soaking tubs. Complimentary access to indoor rooftop when not in use for private events sauna and fitness center. On site restaurant and lounge serves breakfast lunch and dinner with daily food and drink specials. Located in a very walk friendly and restaurant rich neighborhood. Minutes from the milwaukee art museum lake michigan summerfest grounds milwaukee bucks arena and the financial district. Pastiche: On site restaurant and lounge pastiche at the metro serves french and mediterranean cuisine breakfast weekend brunch lunch and dinner served with daily drink and food specials room service available. Daily and late night happy hour available Monday through Friday drink specials available daily. Located in the heart of downtown Milwaukee within walking distance of Lake Michigan the Milwaukee Art Museum Historic 3rd Ward shopping district Milwaukee Public Market the convention center Henry W Maier Festival park and most other attractions. Miller Coors Brewing CompanyThe Miller Coors Brewing Company headquarters located in the Milwaukee Menomonee Valley offers tours to the public of the factory and its legendary beer. Marcus Center For The Performing ArtsThe Marcus Center for the Performing Arts serves as the home of the Milwaukee Symphony Orchestra Florentine Opera Milwaukee Ballet First Stage Childrens Theater and other local arts organizations. Wisconsin CenterThe Wisconsin Center formerly the Frontier Airlines Center is a convention and exhibition center located in downtown Milwaukee.